Very good overall. 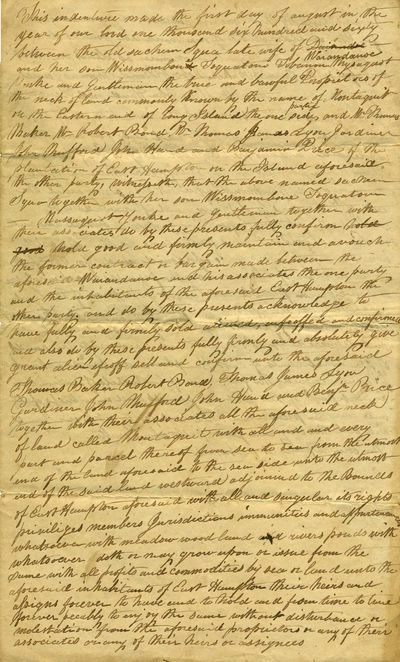 A circa 1800 copy of the original indenture for the purchase of "Montaquit" or Montauk dated August 1, 1660 between native Americans "the old sachem squa late wife of Waiandanoe and her son Wisscombone, Toquaton, Mussuquot, Yourke and gentleman the true and lawful Proprietors of the neck of land commonly Known by the name of Montaquit on the Eastern end of Long Island the one side, and Mr. Thomas Baker, Mr. Robert Rouce (Rouse), Mr. Thomas James, Lyon Gardiner, John Mufford (sic) John Hand and Benjamin Price of the plantation of East Hampton". The indenture describes the location of the land as follows: "the aforesaid neck of land called Montaquit with all and every part and parcel thereof from sea to sea from the utmost end of the land aforesaid to the sea side unto the utmost end of the said land westward adjoined to the [Rouces?] of East Hampton aforesaid ..."
Waiandanoe (also called Waiandance and Wyandanch) was a sachem born around 1620 in Montauk who became the main "alliance chief", one who maintains friendly relations between his tribe and the local colonists. The Long Island colonists gradually granted him significant financial and military support which was helpful in his ongoing struggles with the Mohegans and Niantics. In the 1650s Waiandanoe was in the midst of a fight with Ninigret, the sachem of the Niantics, in which his (Waiandanoe's) daughter was held captive; Lion (Lyon) Gardiner of this indenture was instrumental in acting as intermediary in payment of the ransom for her. In 1659 Waiandanoe appointed Gardiner as guardian to his young son Wyancombone; perhaps this is the son referred to in this indenture as Wisscombone. Lion Gardiner (1599 - 1663) is known as one of the earliest English settlers of Long Island. Gardiner and Waiandanoe developed a long standing relationship on Long Island. Gardiner was a military engineer first hired to fortify the colony of Connecticut; he completed and commanded Saybrook Fort during the Pequot War. Gardiner settled the island now known as Gardiner's Island as a proprietary colony in 1639; according to some reports Gardiner also purchased the island from the Montaukett Indians (Waiandanoe) because of Gardiner's intercession in paying the ransom for Waiandanoe's daughter. Gardiner's royal patent to his island allowed him to "possess the land forever"; since 1639 it has been privately owned by Gardiner family descendants and is the only US property still held by royal grant from the British crown.